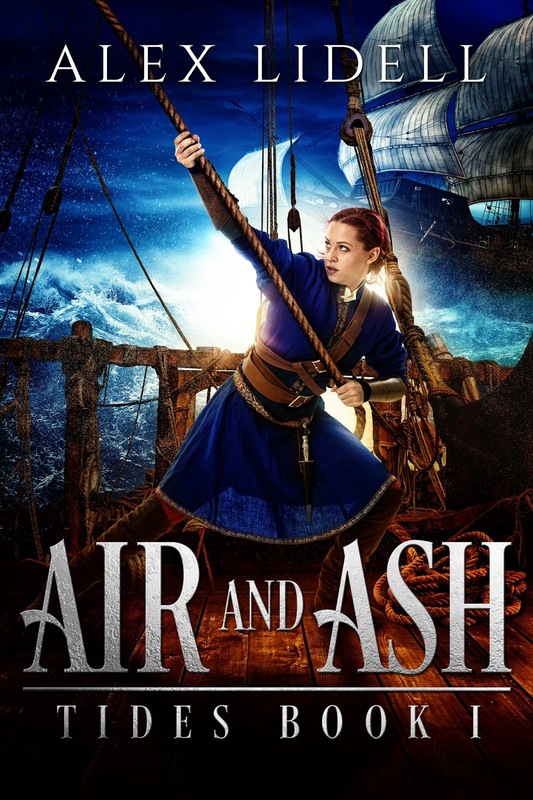 I am so excited that AIR AND ASH by Alex Lidell is available now and that I get to share the news! If you havenât yet heard about this wonderful book by Author Alex Lidell, be sure to check out all the details below. 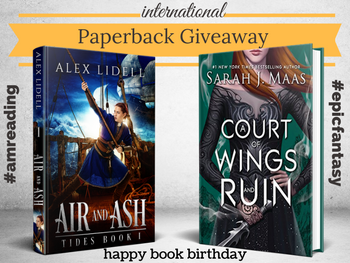 This blitz also includes a giveaway for a finished copy of AIR AND ASH & a copy of A COURT OF WINGS AND RUIN by Sarah J. Maas, International, courtesy of Alex and Rockstar Book Tours. So if youâd like a chance to win, enter in the Rafflecopter at the bottom of this post. Master and Commander meets Tamora Pierce in a seafaring adventure of duty, love, magic, and a princessâs quest to protect her kingdom on her own terms. After a lifetime of training, seventeen-year-old Princess Nile Greysik, a lieutenant on the prestigious Ashing navy flagship, sails into battle with one vital missionâand fails. Barred from the sea and facing a political marriage, Nile masquerades as a common sailor on the first ship she can find. With a cowardly captain, incompetent crew, and a cruel, too-handsome first officer intent on making her life a living hell, Nile must hide her identity while trying to turn the sorry frigate battleworthy. Worse, a terrifying and forbidden magic now tingles in Nileâs blood. If anyone catches wind of who Nile is or what she can do, her life is over. AIR AND ASH is the thrilling first installment of the TIDES series. Recommended for fans of Sarah J. Maas, Tamora Pierce, and Naomi Novik. My breaths come quick, my side vision a blur of sand. The horses rear, showing their bellies and hooves. When Red turns to the beasts, I crash into him. The impact ricochets through me. I drop my rock. Red staggers but remains standing. I wrap my arms around Red and draw the other pistol from his waistline even as he throws me to the ground. I land in a heap and breathless, but my hands still clutch the gun. Three sets of eyes grip me. None give a sign of recognition. I little blame themâhaving spent most of my life aboard an Ashing ship, the only people whoâd reliably recognize me are those Iâve served with. This Felielle trio is unlikely to recognize even Thad outside the throne room, or think twice if they heard my name absent salutation. My palms are moist, but I know better than to let the fear slip into my voice. âI believe the man has understood your message,â I say. Clayâs dog chooses that moment to run up beside me and bare its teeth. Its low growl leadens the air between us. One heartbeat stretches after another, punctuated by the break of waves and the horsesâ snorts. My breaths come quick and shallow. Iâm unlikely to miss at this range, but the pistol is good for one shot only. Red scowls at me, likely calculating whether he might knock me to the ground before I squeeze off the trigger or the horses scamper. He probably can. Bald snorts and makes a decision. âIs the lady correct, Domenic? Has the message penetrated?â He lands a vicious knee in the manâs abdomen. âWhy, that is all we wished to hear in the first place.â Bald pats Domenicâs shoulder and turns away, then twists back and punches Domenicâs jaw as an afterthought. âA pinch of a memory aid.â He chuckles at his joke and, accepting the reins from Red, swings into the saddle. The horses neigh and pick up a gallop, eager to be away, and I raise my free arm to shield my eyes from the flying sand. Alex Lidell is an avid horseback rider, paramedic and ice cream addict. 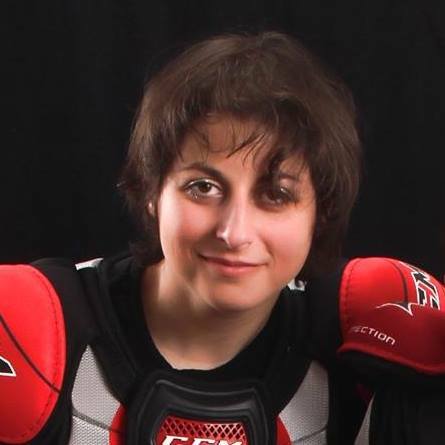 Born in Russia, Alex learned English in elementary school, where a thoughtful librarian placed a copy of Tamora Pierceâs ALANNA in Alexâs hands. In addition to becoming the first English book Alex read for fun, ALANNA started Alexâs lifelong love for YA fantasy books. Alexâs debut novel, THE CADET OF TILDOR, was an Amazon Breakthrough Novel Awards finalist. Her second book AIR AND ASH releases in May 2017. 1 winner will receive a finished copy of AIR AND ASH & a hardcover of A COURT OF WINGS AND RUIN by Sarah J. Maas, INTERNATIONAL.